Just ordered a copy for myself. Your review is all the recommendation I need. Thank you. "I also recommend of course that you buy my book. It covers some more topics that Baggott doesn’t discuss, such as models for inflation, dark matter, various approaches to quantum gravity, and what the absence of supersymmetric particles at the LHC means." is your book available in English at amazon now? also, can you summarize in a sentence or two what you say and about "various approaches to quantum gravity," such as string theory and loop quantum gravity and CDT entropic gravity? I am an optimist and I wait for Baggott's next book "Welcome to reason". "fairy tale science" "Rigorous mathematics" Derivation cannot exceed postulates. Theory dictating observation parameterizes not repairs empirical failures. Then…predict nothing observable. Neopentane, C(CH3)4, is achiral point group T_h. Crowding locks (or at least gears) conformation, then symmetry-reduced perfectly geometrically chiral point group T. Perfluoroneopentane, C(CF3)4, is hugely crowded and locked. Electron diffraction gives bond lengths and therefrom intramolecular rotation barriers and racemization rate versus temperature. A microwave rotational spectrum sources baryogenesis, Milgrom acceleration, cosmological constant, and physical theories' empirical and chiral woes…given a dipole moment. (CH3)3C-COOH + SF4 gives (CH3)3C-CF3. Pivalic acid is commercial. Calculated dipole moment is 2 debyes. Look for enantiomers’ non-identical microwave rotational spectra. Look. The English version is available for preorder on amazon, the website is here. As an experimentalist, I've always viewed various oddball experiments, exotic particle searches, and other more speculative analyses as basically harmless provided the authors at least do their math and statistics correctly (harder than it sounds). Even further, I feel that having a richly-diverse experimental particle physics program is vital to science, because you can never be absolutely certain what kinds of experiments will turn out to be historically important until after the fact. (Today we do NOT have a rich experimental program globally, but that's a tangent here.) And it's easy to say that some kinds of research were a waste of time *after the fact*, especially when we're so indoctrinated with revisionist history. So I wonder about similar criticisms of string theory, supersymmetry, multiverses etc today. Is this all just a "postdiction" of theoretical explorations that have thus far failed? Obviously we want diversity on the theory side as well. Is it that funding and efforts are severely lopsided to the point of monoculture? Or is it that, as usual, popular science writers are not accurately characterizing the speculative nature of certain theories, jumping into philosophy way ahead of empirical evidence? I guess both are happening. Anyway, insightful criticism is important, as long as it's not at the expense of diversity. Hi B. Looking at Amazon.co.uk - will Basic Books be releasing a Kindle version of your book please? I've been sloooowly reading Baggott's book. With your excellent review, I'll get back to it and wrap it up. 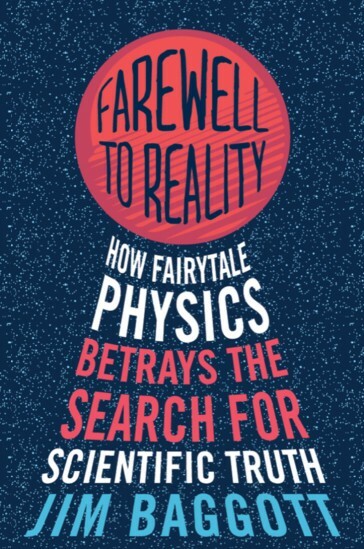 Being an armchair observer of physics with a strong background in philosophy, and a pretty voracious reader, over the last decade I've come to much of the same concerns that Baggott and you express, in your new book. So it seems like more and more independent-minded people are saying enough is enough. Will it eventually make a difference? We'll see. So again you discover that you are not entirely alone in your view that there are troubling tendencies in modern physics and that these go deeper than misleading reporting by the popular media.. At some tipping point a significant conversation within the scientific community will emerge. Those psychological cases where the monkeys's intellect had deceiving itself into believe that itself can grasp Unity over everything. Simply, Greatness delusions dressed as "Posthumous legacies for more selfdelusional Apes's colective patterns"
Jim's book is excellent, a good read whether you agree with him or not. Yes, strong monoculture on the theory side. It's basically impossible at this point to get something new going, not if you're not already famous. I see a lot of young people leave for this reason. Very strong rich-get-richer pipe. Though at least in Germany we still have a side-population by people who were tenured before that. Most of them now near retirement though. This isn't a problem which originates among popular science writers. Actually, I used to think that. But in almost all cases I looked into the matter the origin of the "misinformation" came from scientists themselves. Now one can argue that science writers should be more critical and not just believe what some scientist tells them to advertise their research. And indeed I agree with that. But I think it's expecting too much of science writers because in the cases that I know of you basically need a PhD and several years research experience in the field to decode the math. (There's a reason my book is called "lost in math"). I am very sympathetic to his (and your) frustrations. But I also read that this was the exact same reaction that Einstein received for his two theories on relativity. This widely shared opinion was reportedly the reason that he did not get his Nobel Price for his most important work. And even Einstein considered Quantum Mechanics to be too weird for words. There are still people advertising on this very blog that neither GR nor QM are true. If we go back to the 19th century, Faraday et al. seemed to have met the same type of response about electricity and magnetism. If I look at the field today, it seems to me that pace of progress beyond the Standard Model and the link between GR and QM is not making me hold my breath. If there is any progress, it seems to be in this fairy tale field of "black hole evaporation" that we might expect some progress. You just discussed a paper of yourself that might have benefited from this speculation. My question would be, if not for fairy tales, what else is there to get a foothold beyond the SM and in GRxQM? You seem to argue that the situations are comparable because the reactions of the community are comparable. First, I am not sure that is correct, but I am not much of a historian. Maybe more importantly, this isn't the point. The two cases are empirically and theoretically entirely different. Both EM and GR made testable predictions and no bubble of eternally unfalsifyable models followed. The closest thing to what we see right now in the past might have been "vortex theory" which Helge Kragh has written about (see eg his book "Higher Speculations"). Ohm's law was probably the most important of the early quantitative descriptions of the physics of electricity. We consider it almost obvious today. When Ohm first published his work, this was not the case; critics reacted to his treatment of the subject with hostility. They called his work a "web of naked fancies" and the German Minister of Education proclaimed that "a professor who preached such heresies was unworthy to teach science." On the subject of Multiverses and CCC and bouncing Universes. Dark energy being extremely weak (QFT prediction being so wildly wrong) would appear to require a multiverse,CCC, or bouncing I have recently being reading (article over at quanta) but it does not explain why that would be. Any merit to these arguments ? Speaking of riding your mentions, we're doing a podcast on this subject.